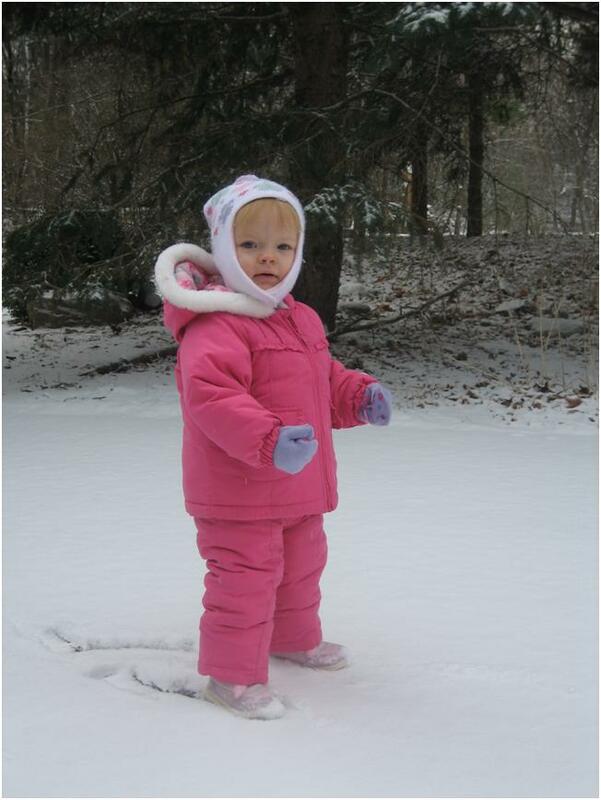 snow | Blog, Jane! Blog! Wow – It has been a long time since we’ve seen this much snow… Saturday we woke up to a decent covering, but the sun was shining and it didn’t stick around much. We went out for a little bit. Charlie knew exactly what to do. Throw the snow. Aim for Maria. Sunday we woke up to snow and it just kept snowing. ALL DAY LONG. We went out a little in the morning to clear off the driveway. Thinking about this, we barely had any snow last year. And the year before Charlie wasn’t even 1. So you can imagine how excited he was on Sunday being out helping Daddy dig! The other excitement for the day was a cat had found his way into our garage and refused to leave last night. Once we had it cornered,we realized this was not a stray cat. He was a lost cat. And he did not want to go back out in the snow. So I called 911 to have someone come and get this poor cat out of our garage, because we thought he was stuck and possibly injured as some firewood had shifted on the shelf he was under. While we waited we lured him out from under a shelf with some milk and chicken. Eventually the police came and we got the cat in a box and he took him to a shelter. And we re-assembled our garage as we had pulled everything out as the cat found new hiding places. 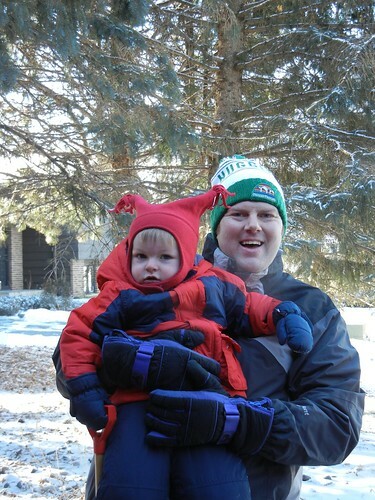 All in all a good weekend… topped off sitting warmly at home while the Packers beat the Lions at a snowy Lambeau Field. We didn’t get much, but we finally got a little snow and Charlie finally got to wear his snow pants! He loved it! All boy! He helped shovel the whole time Chad was shoveling! And cried when they were done, so then Chad pulled him around in the sled for a while, and he even got in a quick swing on the playset. Note: the wall behind him that I “took out” last week with our truck. 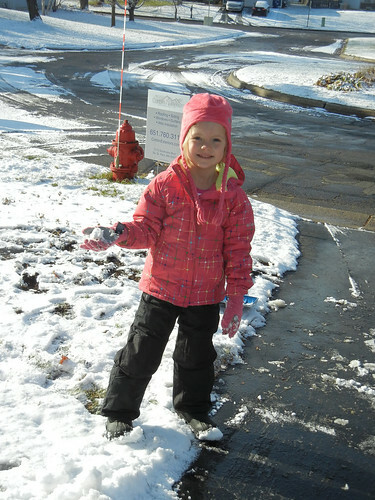 Yesterday, since we had a short-thaw, we decided to scrape the packed down snow from our driveway. Maria did not want to go outside, but once we had her out, then it was tough to get her back in! 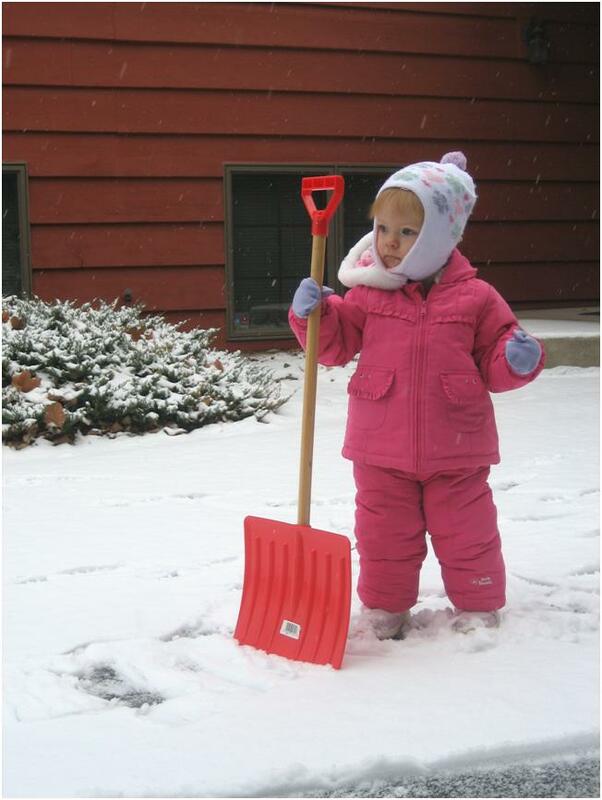 She was sad when I took her shovel away, but we were able to lure her in with the promise of vacuuming! She loves it when we vacuum!! We woke up to snow this morning! Not a lot, but enough that the driveway needed to be scraped off. After breakfast, Maria and I headed out to check out the situation. I got out both of our shovels and we went to work. Maria figured it out pretty quickly, but she learned if she leaned into it too much, she’d end up face down on the driveway! But she was not about to give up and go inside! After the driveway was cleared (and she’d taken 3 falls on her face) I had to bribe her with Elmo on TV to get her back inside! 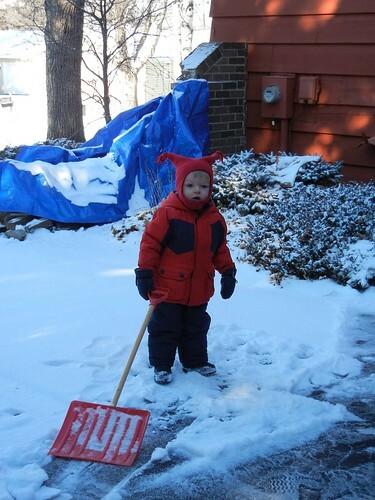 Of course the title of this post, refers to the song we sang outside the whole time we were shoveling – (to the tune of Jingle Bells, as heard on Elmo’s World) Snow, Snow, Snoowww. Snow, Snow, Snoww. Snow, Snow, Snow, Snow, Snooowww. We may be in for some winter fun this year!! Earlier this week we had nice weather. Nice enough to go out for a walk. This was Wednesday. This (Friday) Morning – This is our driveway. 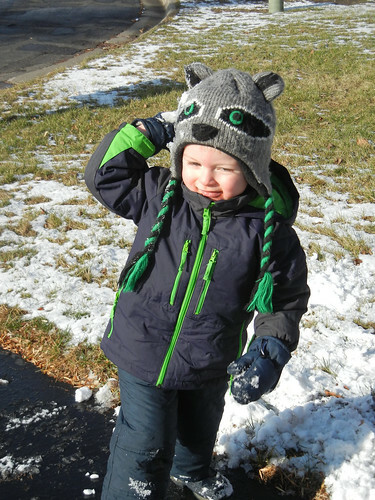 2 hours prior to this picture, I blew about 4″ of snow off of the driveway! And it was still snowing at the time of the picture! Daycare was closed today for the holiday, so I wasn’t going to work anyway. I was kind of relieved to know I didn’t have to commute in this mess today. Since we were cooped up, Maria explored. She found all of Daddy’s remotes in the amusement room. Mommy had to take her away from his “Guitars” a couple times too! Seriously, she doesn’t seem to be having that much fun, but she didn’t like it when I took it away either! Going to find Daddy’s Nascar game. Who cares if Mommy’s laundry project is in the way! I kept bringing her back here, but somehow this wasn’t enough today to keep her occupied! Saturday I woke up.. it wasn’t snowing yet, but it started around 8 and snowed ALL day! I left around 11 a.m. to take Maria to her grandparents for the night because Chad was having the guys over for his birthday that night. I slid on the interstate right after I got on it, so got off at the next exit and came straight home. Maria and I spent the afternoon cleaning and cooking… at least I did! But she helped by taking naps! I also took a cue from Kelly and got her a self-feeder at Target on Friday. Saturday morning, I gave her frozen blueberries and peaches. She loved the blueberries! I then put on Baby Einstein and situated her in her high chair, so I could get some baking done. Last night, Chad’s friends made it over (no one let the snow stop them. Maria was very aware that the house was full of people, and she did not want to miss a thing and would not go to bed until 10:30. Also today Nicki and Heather came over and we baked Christmas cookies, I think 6 different kinds total for the freezer! Not much else. What can I say?